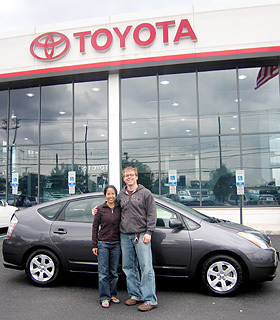 After doing some research on buying a new car, we decide to visit the Toyota dealership that was less than a 3-minute walk from our apartment and take a look at a Prius. Being green-minded, we opted to go for a hybrid. We meet Nick, who shows us the different cars, colors and options. He also said that there was a waiting list for 9 months for these cars and because the car had gotten so popular, their supply has gone up, about 50 cars this month, but because of the demand, they only had about 6 left, but not in the color we wanted. We were definitely interested in buying one, but we weren't ready to sign any papers just yet. During the course of our 2 hour visit (! ), we ended up waiting around for a good amount of time, watching as the salesmen walk back and forth, trying to find out if the car is available in the color and package we wanted. While waiting, we make small talk with Nick who turns out to be from Kazakhstan. I couldn't look at Brian right away, thinking that something may be said in reference to Borat, but thankfully we held our composure. Nick finally told us that there is a car located at another dealership that they can have brought here, but we decided to mull over it a bit and come back the next day. 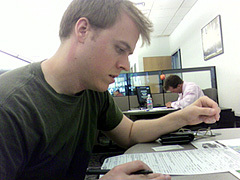 Nick looked rather disappointed as we told him that, thinking we would be signing papers that day. We decide to buy the car and head back to the dealership. We take a test drive in one of them - very cool! It's practically a toy with the joystick and touchscreen and rearview camera. As we would be leaving Boston for good the following Friday, we had to make sure that we would have the car in the next few days, so we didn't sign anything until they told us the car would be available within the necessary time frame. Again, after waiting a long time, lots of walking back and forth among salesmen, manager, etc., Nick said that the car should be at the dealership tomorrow or at the latest on Saturday. That's definitely doable. So we give our down payment and sign the plethora of papers with a sense of nervousness and excitement - my first car, and Brian's first new car. Awesome! So we would have a car our last week in Boston to help with running errands and wrapping up loose ends. still no car. With all the running around we had to do, thank goodness for zipcar that week. So after talking or leaving a message with Nick practically every day since we signed the papers, he calls Brian in the afternoon, after commencement, that the car would not be here in time, as in not here the next day. That certainly put a damper on the festivities. Earlier in the week, Nick said that the car "hadn't docked yet" in New York?! What, it's on a boat? What the heck? Talk about giving us the runaround and a bunch of lies. A new game plan had to be created since unfortunately, we still had a crap load of things that needed to be transported to either of our parents' places as well as some smaller items to our new apartment. So as we gathered our last few things, packed the cars, cleaned the apartment, Brian and his dad went over to the dealership to void the sale and get our money back. Good thing that the manager did not give them a hard time and agreed to give back the money without hesitation. I was surprised to hear that, but that's how it went down. 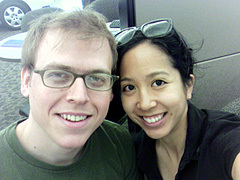 However, we were not going to leave until we get the check in our hands and deposit it into our account. That meant sticking around until 1pm, which was later than we had wanted to leave. Brian also went to pick up our rental car which cost a pretty penny for the length of time we needed it or at least planned on needed it. Some better foresight would have made the next few days easier on all of us. We drive down to NJ and spend the night at my parents' place before heading down to Philly for Brian's grad party. Noticing the large Toyota dealership just a few blocks from the house on our drive down the day before, Brian and my dad decide to give it a whirl and see if they had a grey magnetic prius with the package we want. I stayed at home organizing what was to stay and what was coming with us. Looks like the visit to the dealership paid off as they were expecting to receive the model we wanted, at the latest on Wednesday. Here we go again...will it be an empty promise just like Boston? but Brian was adamant in telling Bob, our new salesperson, our situation, so he better not screw up. We were actually going to get a nice discount at the Boston dealership due to the end-of-the-month quotas, but Bob pointed out that we didn't actually get a car out of it, so we didn't get a discount. Knowing that someone else will just buy it if we don't, we didn't get a discount with Bob either. We drove ahead in the rental car to help get ready for the party, while the folks, Elmer & Hoong-San drove down a little later. They would drive back up the same night. Not thinking ahead, as I mentioned earlier, Brian and I had access to a car that we could have used the next few days as we waited for our Prius to arrive: my parents' Pilot. Essentially, we have to go back to NJ to pickup the Prius. Having the Pilot would have made it easier since it would be a simple roundtrip. But instead we have to borrow one of Brian's parents' cars, a Buick, hold on to it until we actually get the Prius, and drive it back down to Philly - a multi-stop trip. But that was the plan we had to make - return the Buick on Wednesday. We head to our new home: Bethesda, Maryland in the Buick. I use the Buick to drive into DC for a photography job. Trying to unpack as much as we can, we anxiously wait to hear from Bob as to the status of the car. We do not find out until around 6pm that the car is finally at the dealership. I even call my dad to make sure. So we drive up in the Buick, holding on to it a day longer than expected. Two weeks after signing the papers in Boston and after loads of time and energy wasted, we finally get a car!!! What an ordeal! Brian drives the Prius as I drive the Buick to Philly before we head down to Bethesda to finally settle down in our new, yet disastrously box-filled apartment. I wish Brian's week off before starting work wasn't so hectic driving around so much. With all the driving we did, we soon learned that the drive from Boston to the folks' was SO much easier, with less time and less money. Traffic on the infamous Beltway and I-95, and one-way tolls at around $16 have become our nemeses. But we are closer to Brian's family which is good thing.